‘New Generation’ offers fully qualified, passionate and fluent English speaking instructors and absolute fantastic service! They start their ski lesson at Saint Martin’s main gondola and offer all sorts of lessons including a full day adventure (ProXplore) for great value! Just let us know as we are more than happy to help organise ski lessons for you! And remember that lessons do get booked out quite quickly, especially during peak weeks! “Ski School – St Martin” offer a wide range of private lessons for young and old. Skiing, snowboarding, off-piste guiding, heli-skiing, snow shoeing and ski touring! Fully qualified ski instructors with an extensive knowledge will show you around the huge Three Valley ski resort! 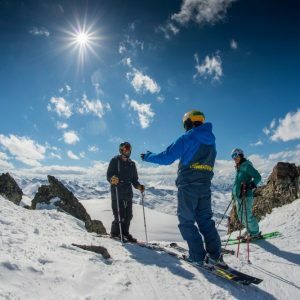 “Ski School – St Martin” has specialised in ski lessons in English to cover the large demand of English speaking guests in Saint Martin de Belleville! Please just have a look on their website for more information and don’t hesitate to ask us if you have any more questions at all! ESF ski school is also based in Saint Martin de Belleville and offers ski lessons for everybody. ESF Nursery Piou Piou Club (18-30 months) and Mini Club (2.5 – 5 years) welcome your children in a fun and playful environment! ESF also offers a wide range of lessons including group lessons and private lessons as well as off-piste, guiding and snow shoe outings! Please just have a look at their website for more information.